- Scroll down for detail scans. - Please do not remove watermark and share with full credits. A love song from a movie. I often watch romantic comedies. Sharp eyes, and a very deep rapping voice. 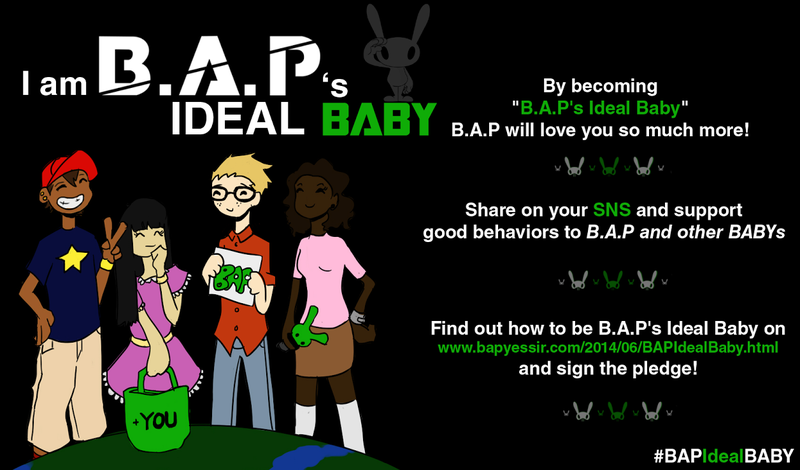 B.A.P's leader Bang Yongguk has a very cool character for an idol. "Music is not only to enjoy, I think that there is a lot to learn from it too. That's why we have meaningful lyrics. I want to make them so that they are still valuable even as time passes." 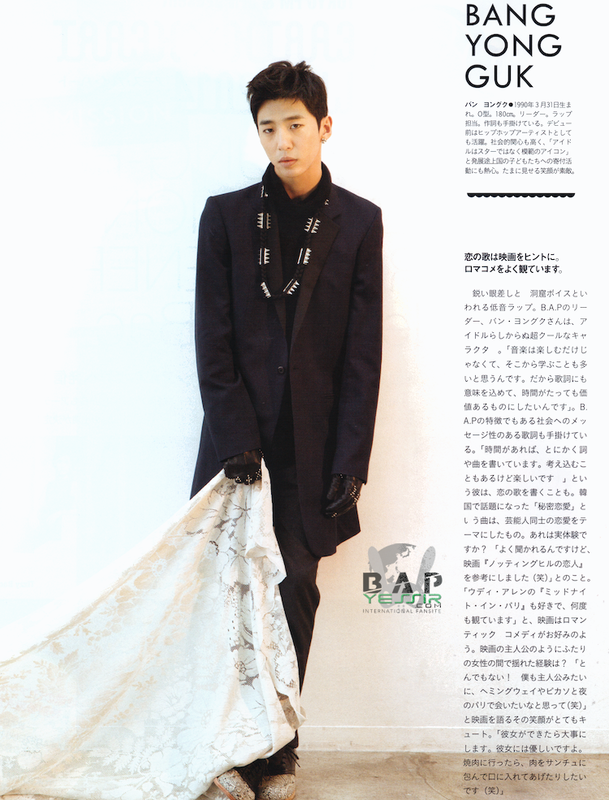 He has a hand in what could be said B.A.P's particularity, lyrics that deliver messages to society. "Whenever I have time, I write lyrics or music. There are times when I think too much but I'm having fun!" He also writes love songs. The song "Secret Love" that became a topic in Korea is about the relationship between two celebrities. Was is from experience? "I get this question a lot, but I was inspired by the movie "Nothing Hill" (laughs). I also like Woody Allen's "Midnight in Paris" and have watched it countless times." It seems that he likes romantic comedies. Like the main character, has he ever been between caught between two women? "No way! Like the main character, I want to meet Hemingway and Picasso in nighttime Paris (laughs) " he tells us about the movie with a very cute smile. "When I get a girlfriend I'll care for her. I'll be nice to her. If we go eat BBQ, I want feed her meat wrapped in lettuce (laughs)." Instead of giving things, I want to look for things we can do together. 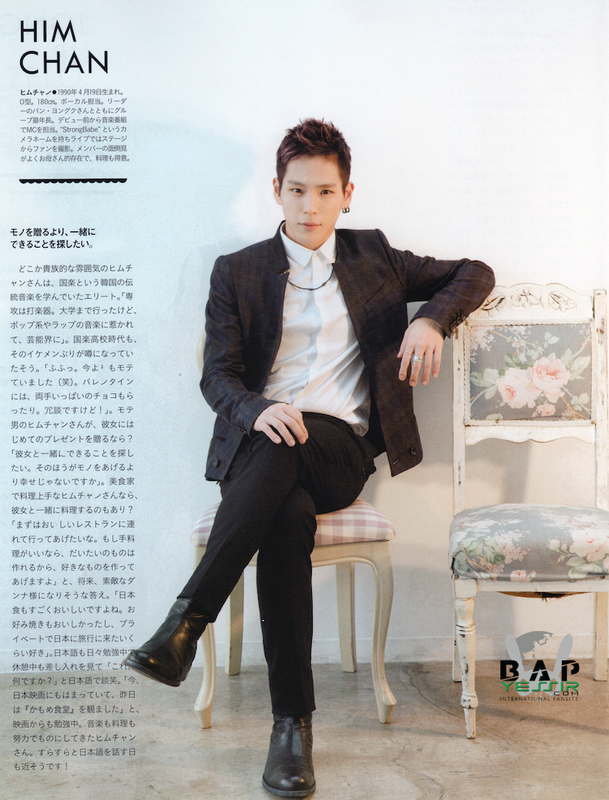 Himchan has a noble air about him, and used to be part of the elite, studying traditional korean instruments. "My major was percussions. I studied it until university but I became attracted by pop music and rap and so I entered the entertainment industry." Even during his high school days, his good looks were known. "Huhu, I was even more popular than now (laughs). For Valentine's day, I always got both my hands full of chocolate. I'm joking!" What first gift would the popular Himchan get his girlfriend? "I want to look for something that we can do together. It would make her happier than if I were to give her something, right?" Does the gourmet and good at cooking Himchan wants to cook together with his girlfriend? "First I'd like to take her to a good restaurant. If she'd rather have something home cooked, I can cook most things so I'd make her what she likes." An answer that hints at how wonderful of a husband he'll be in the future. "Japanese food is really good. The okonomiyaki was delicious, so much that I'd really like to come to Japan privately for a trip." He's studying Japanese everyday, and even during the break he lightheartedly chats in Japanese. "Right now I'm really into Japanese movies, I watched "Kamome Shokudo" yesterday." He's even studying from movies. 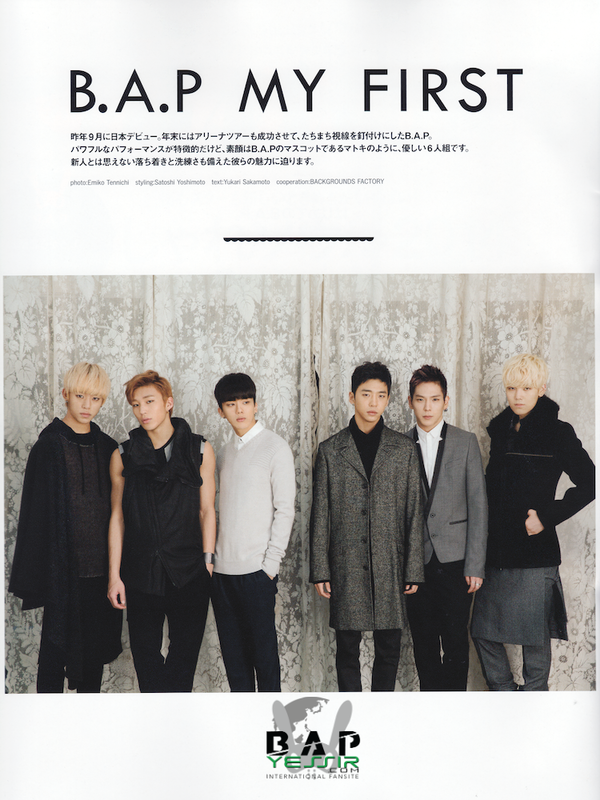 Music, cooking, Himchan has made things his with efforts. It seems that the day when he'll speak fluent Japanese is close! When I get a girlfriend I really want to share a pair item with her. Eyes that get you drawn in and a refreshing smile. 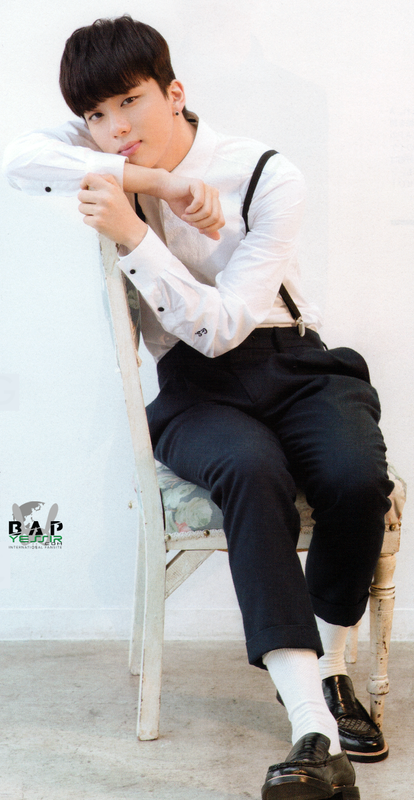 He can sing 7 octave high notes and give's B.A.P's music a certain color. "It's not like I was able to sing high notes from the beginning. I acquired it step by step, with vocal practice. You'll probably feel refreshed after hearing me sing!" With both a perfect voice and perfect looks, his fans are divided between those who prefer him with bangs and those who prefer him without. "I think bangs suit me better~" he laughs shyly. 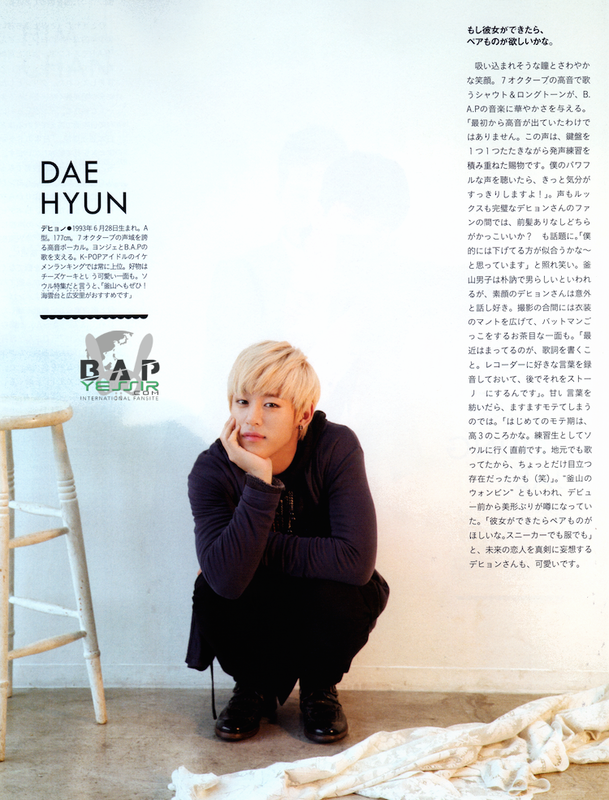 Men from Busan are said to be quiet and masculine, but Daehyun unexpectedly seems to like to talk. During a break we saw a playful side of him as he played with the mantle of his outfit, imitating Batman. "Recently I'm into writing lyrics. I record words that I like, and later make them into stories." He seems like he would be even more popular once he start saying sweet words. "The first time I was popular was around my third year of high school, just before I came to Seoul to be a trainee. I was also singing then so maybe I stood out a bit (laughs)" He was famous for his looks even before debut and is also nicknamed "Busan Wonbin." "When I get a girlfriend I really want to share a pair item with her. Sneakers or clothes." 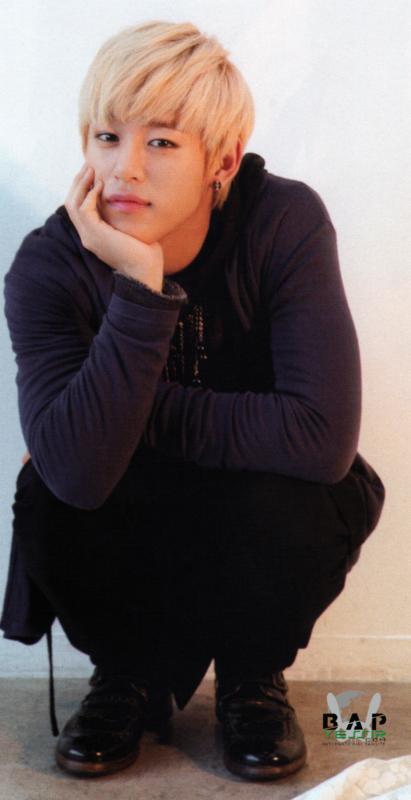 The Daehyun that imagines seriously his future lover is also cute. On a stage just for her, I want to sing her a song that I wrote. 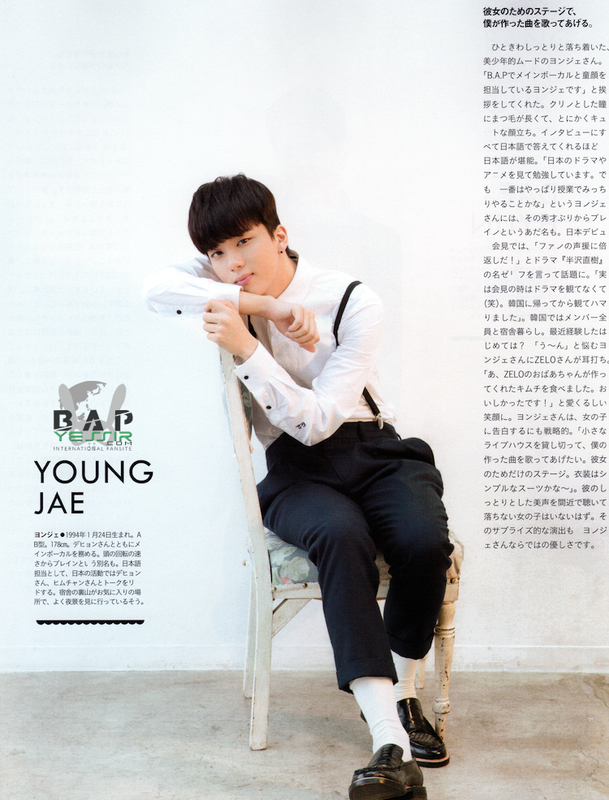 Calm and with a cute boy aura, Youngjae. 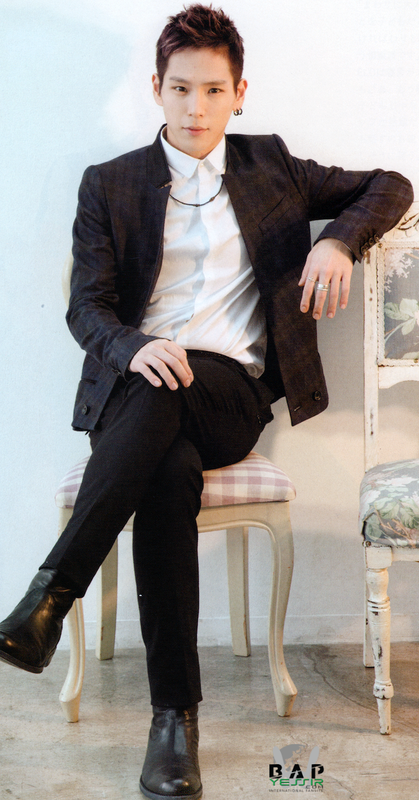 He greets us "I'm Youngjae, in charge of the main vocals and the baby face." Pretty eyes and long eyelashes, his face is very cute. His Japanese is very good; he answers all of our questions in Japanese. "I study Japanese by watching anime and dramas. But the best is just to really takes lessons and study hard." This is where is nickname "Brain" comes from. In their Japan debut event, he said "We'll return twice the support we got from fans! ", a famous line from the drama "Hanzawa Naoki", and it became a hot topic. "Actually, I hadn't watched the drama at that time (laughs). I watched it after coming back to Korean and I got really hooked." 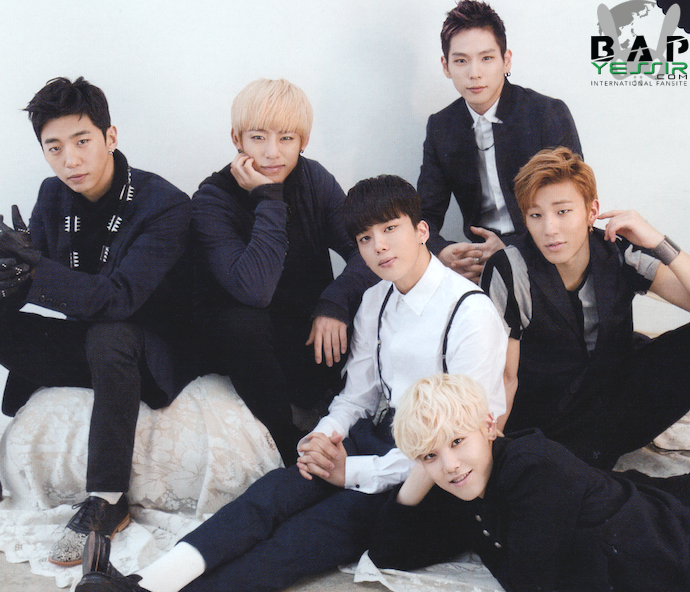 In Korea, all the members live together in a dorm. What is something he did for the first time recently? 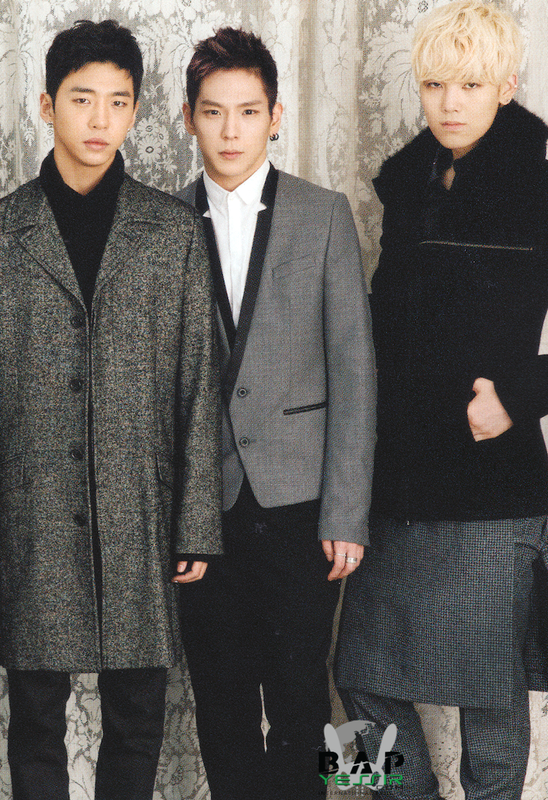 Youngjae thinks and Zelo whispers in his ear. "Ah, I ate the kimchi that Zelo's grandmother made. It was delicious!" He smiles an impossibly cute smile. Youngjae seems strategic in his approach to confessing to a girl. "I'd rent a small live house, and I'd sing her a song I wrote. A stage just for her. I guess I'd wear a simple suit~" There isn't a girl who wouldn't fall for him while listening to his beautiful voice up close. This kind of surprise performance is also part of Youngjae's gentleness. He's labeled as mysterious by the other members and has a particular sensitivity. "People around me say that the fact that they can't understand me is interesting and it's that's my charm… I guess?" 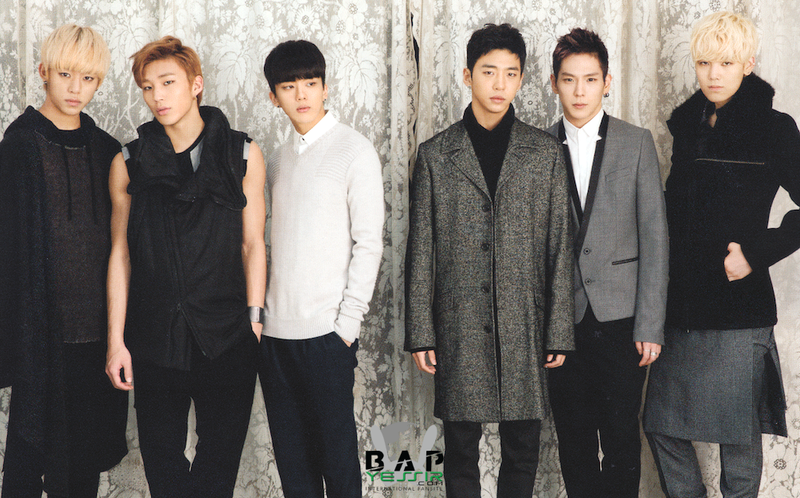 Usually smiling, Jongup leaves a soft impression. But, he seems like a completely different person when he's dancing on stage, full of strength. "Our dances have big movements and are strong. We usually have choreographies that are very masculine. I think the most difficult one is "Power". It's hard to do small movements and keep the rhythm." Expected of the group's dancing machine, he's talkative when it comes to dancing. 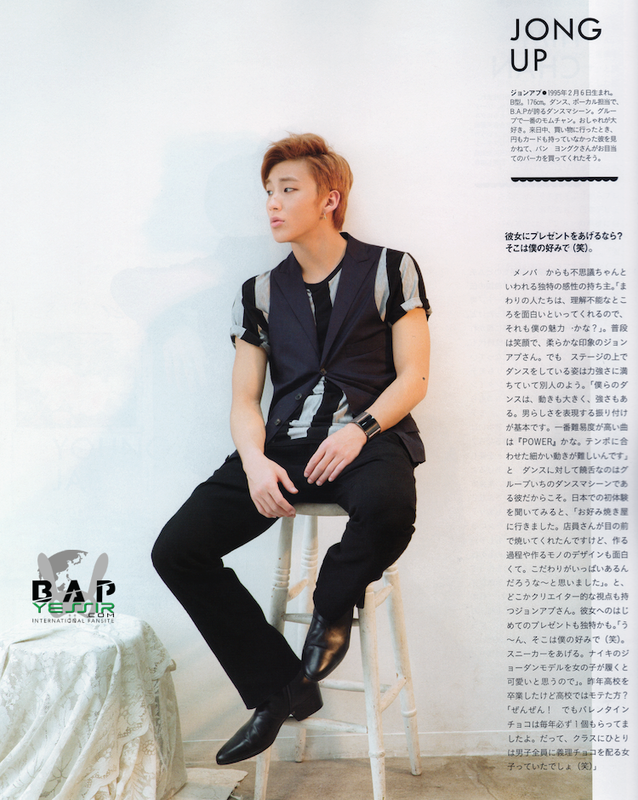 When we ask him about his first experience in Japan, Jongup tells us "We went to have Okonomiyaki. It was made in front of us and the process and the design was very interesting. I thought that there must be a lot of specific elements involved into making it." His thoughts about the first gift he would give his girlfriend are also particular. "Hmm, I'll chose something I like (laughs). I'll give her sneakers. Because I think that girls that wear Air Jordans are cute." He graduated high school last year but was he popular in school? "Not at all! But I always got one chocolate for Valentine's day. There was always a girl that would give giro-choco (T/N: "obligation chocolate", chocolate you give someone you have no romantic attachment to.) to all the boys in the class (laughs)." If I were to confess it would be with my song. Zelo that distinguishes himself with his fast rap, attracts fans with his provocative expressions and impressive performance. He looks very mature on stage, but when he's just talking with the other members he's the youngest at 17, still full of cuteness. "When there are adults around I think of myself as a child but if it's not the case I'm rather adult (laughs). I'm pretty cautious." 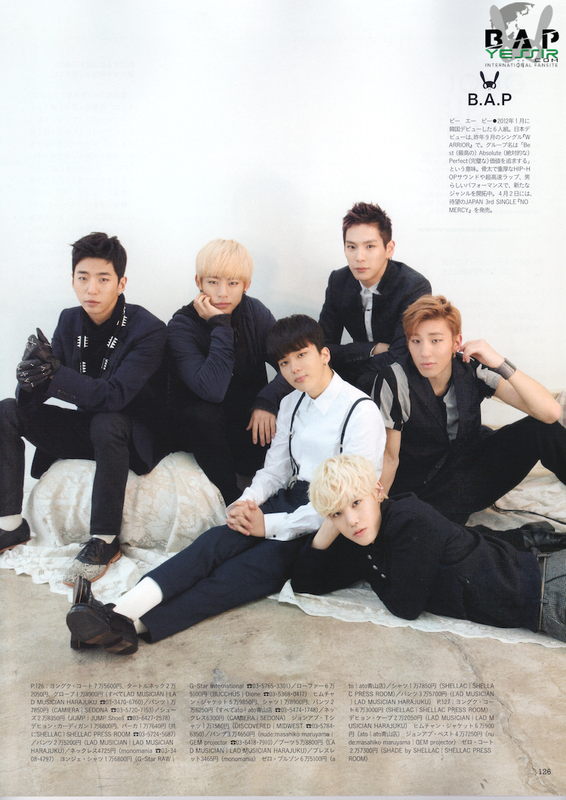 We heard from the other members that "Zelo's sleep talk is amazing." "I don't talk in my sleep. I'm not a child!" About his fast rap, "Usually, I don't act nor talk fast. ", he laughs shyly. The way his voice goes quieter when he reaches the end of sentences also contrasts to when he is on stage. "Before I go on stage, I empty my heart and think "This place is mine!" 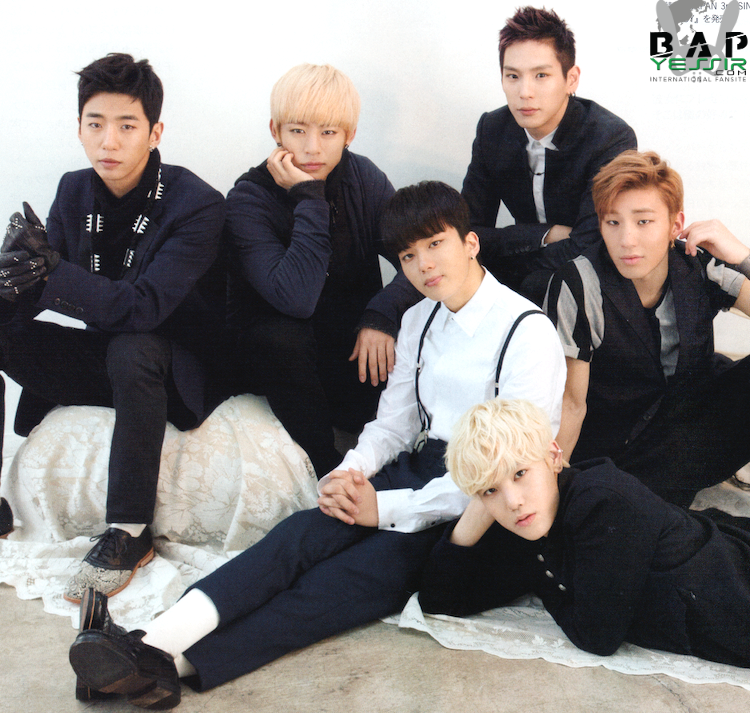 When I do this I can become B.A.P's Zelo." He is fashionable to the point that even when he's just going to the convenience store he checks his outfit from head to toe. What about today's outfit? "It's my first time wearing clothes like these. I've never worn them as outfits or as regular clothes, but it's a style I had been wanting to try so I'm happy." 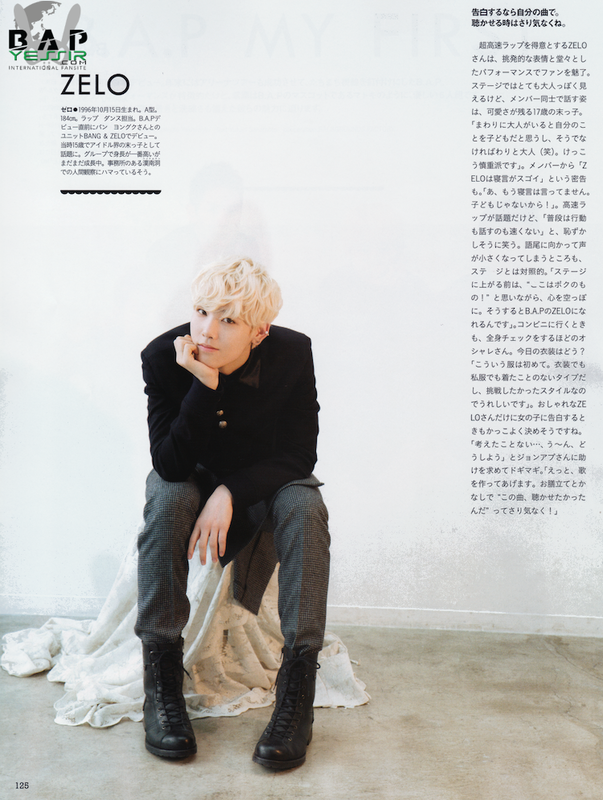 The fashionable Zelo seems that he would be able to cooly confess to a girl. "I've never thought about it… Hm~m, what should I do." 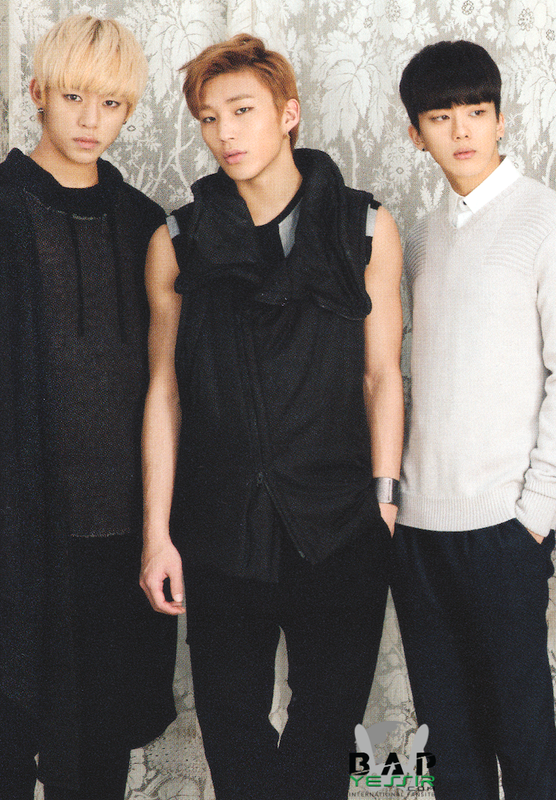 He goes to Jongup for help. "I'd write her a song. Without setting anything up, I'd just tell her casually "I wanted you to hear this song"!"